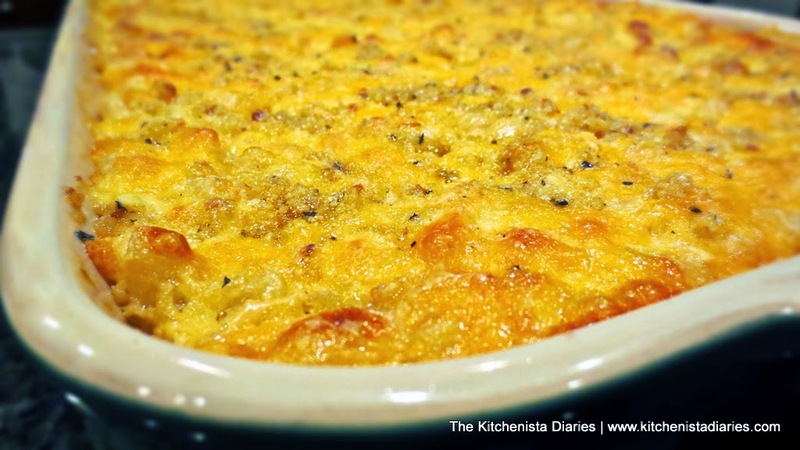 For years I relied on a tweaked version of a well-known recipe for custard style mac & cheese. What I love about custard style is how easy it is to throw everything in the same pan and bake it. It was cheesy and deliciously comforting and always pleased whatever crowd I served. It was perfect for barbecues and holidays when I was doing a lot of cooking and the last thing I wanted to be doing was whisking lumps out of a white sauce. The problem? The original recipe called for a considerable amount of Velveeta in it. Say what you will about Velveeta, but it has its place in a handful of trashy traditional dishes. I’m not here to debate that or deny that I’ve ever enjoyed them. However, what I can’t feel good about is including processed cheese in what I’d consider one of my signature dishes. Despite my best efforts, nothing I tested really ever came close to giving my custard style mac & cheese the same gooey melt. If I wanted a creamy baked mac & cheese, it was going to be necessary to return to the traditional way of going about it…making a roux. 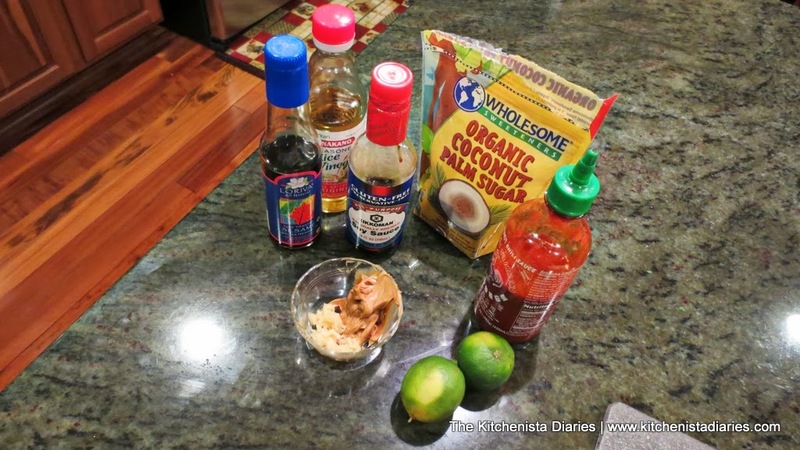 My old recipe, a holiday & bbq staple! I’ll admit, making a béchamel (aka “white sauce”) for mac & cheese used to be a pretty intimidating process to me. Besides the extra time and attention involved, when it’s not properly made, the finished dish can have a floury aftertaste or grainy texture, and nobody wants that. 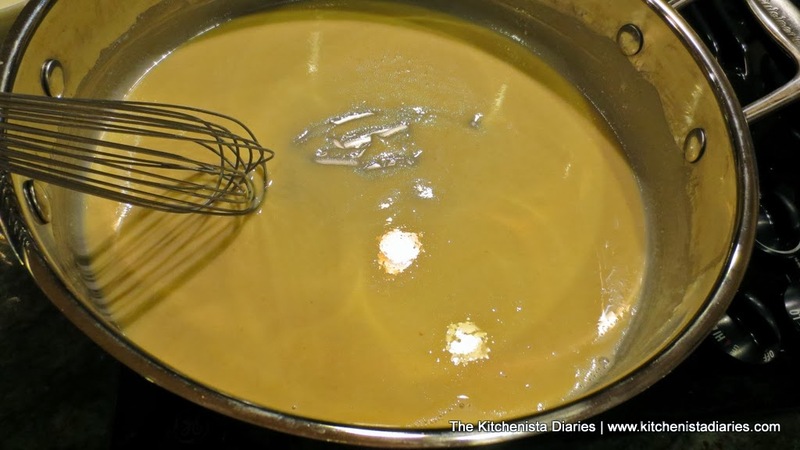 I did my research on how to make a proper roux and learned about butter to flour ratios, what kind of milk to use, and how to remove those pesky lumps (hint...there's a better tool than a whisk!) I tried combination upon combination of cheeses trying to get that perfect blend of sharpness, nuttiness, saltiness and the right melt factor. I experimented with a variety of seasonings, ultimately to find that a splash of Worcestershire sauce was what I'd been missing for so long. 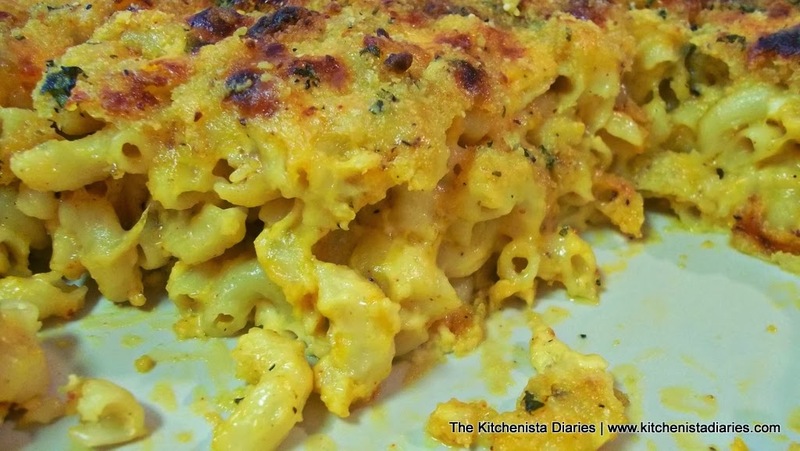 I toyed around with the type of dish to bake my mac & cheese in and whether or not it needed a crumb topping (yes!) I had a couple fails but mostly really great trial mac & cheeses. I know what you're thinking...lucky you! Who doesn't want to test mac & cheese over and over again? Well you'd be surprised to know I hit my limit, both in my wallet and with my disappearing waistline (okay, so pregnancy had a little bit to do with that, but overdosing on mac & cheese certainly contributed.) 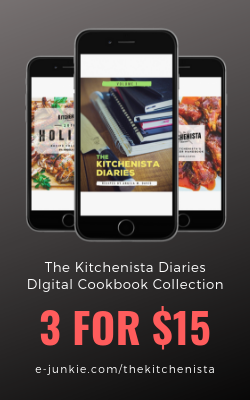 Gourmet cheese is ridiculously expensive to buy and ultimately I felt like the recipes I came up with were just a tad bit too rich to fully enjoy. 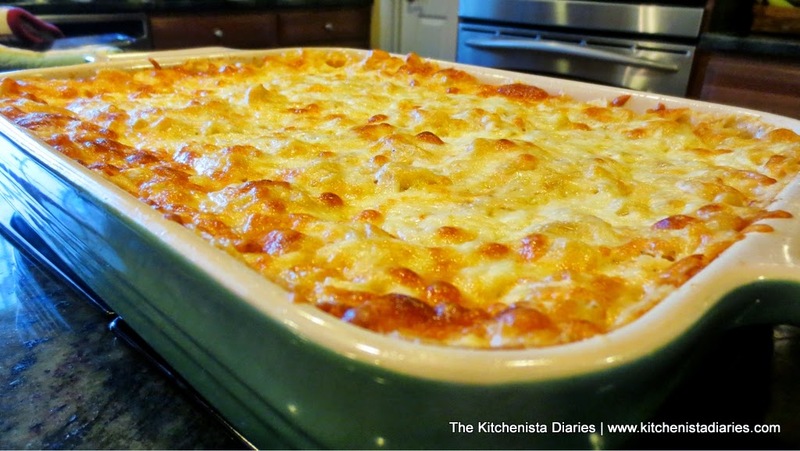 Muenster mac & cheese trial, which made an appearance at Thanksgiving this year. Just as I was ready to throw in the towel and go back to Velveeta, my mom inadvertently saved the day. On this particular night, she had cooked a batch of mac & cheese to take to a neighborhood party (she does a version of my custard-style recipe) On her way out, she let me know that there was extra cheese and a box of noodles leftover if I wanted to make some for dinner. Now, if there's one thing my mom and I don't see eye to eye on it's often food, specifically on spending extra money for gourmet or organic ingredients. So I knew when she said there was extra cheese leftover, it would be the basics and to be honest I wasn't too excited about it. I nodded and went right back to settling in front of the TV for the night. Well, it didn't take long for that nagging voice baby in my head belly to tell me to get off the couch and figure out what to eat. 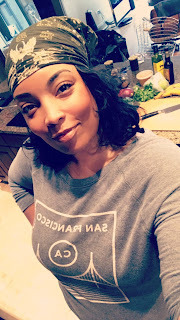 Now that I'm living back home with my family, I rarely get the kitchen to myself on the weekends, which can make it a little hard to get "in my zone" when I need to work. I decided to take advantage of this quiet night and try to finalize my recipe. One of my earlier Velveeta-free experiments. I looked in the fridge and sure enough saw a big block of store brand cheddar cheese and Muenster. I dug a little deeper and found half a block of pepper jack and some grated Parmesan leftover from my last batch of gourmet mac & cheese. No half & half, but we had organic whole milk. Regular elbow noodles, not the brand name Cavatappi I'd taken a liking to. Regular flour was all we had left, as I had used up all the Wondra at Thanksgiving. It wasn't much to work with (quality-wise), but as far as quantity goes it was exactly enough ingredients to make a full recipe. I took that as a sign and went to work. The results? A surprisingly satisfying, amazingly creamy, flavorful baked mac & cheese that I would be proud to serve at any event. So...maybe my mom was right (this time) and I didn't need to use anything more than "regular" cheese after all to make a good mac & cheese. I'm not going to say I'll never find the need to put a gourmet spin on this for special occasions, but I will say that it's kind of cool not having to drop $50 on five cheeses that to be honest, the average person isn't going to distinguish from one another. All that practice wasn't for naught though, as getting the right technique down is ultimately what helped me perfect my recipe, and that's what I hope you take away from this more than anything else. Classic mac & cheese certainly isn't a quick dish to make, and I'd hesitate calling it easy, but it's one that's worth taking your time to make right! This recipe requires a bit of multitasking if you don't want to be standing over the stove for an hour before you even get it into the oven. You'll be warming milk, preparing a roux and boiling pasta all at once. For that reason, you may want to make it ahead of time if you are cooking a large dinner and will need to share the stovetop! It reheats easily in the oven; just cover with foil so as not to over brown the topping. Always buy your cheese in blocks and grate it yourself at home. Pre-grated cheese is usually coated with powders to prevent clumping and this can affect how it melts into your béchamel sauce. The recipe as written isn’t spicy, but if you’re extra sensitive to heat you can substitute Monterey Jack cheese in place of Pepper Jack. Cavatappi noodles may also be used in place of traditional elbow macaroni. 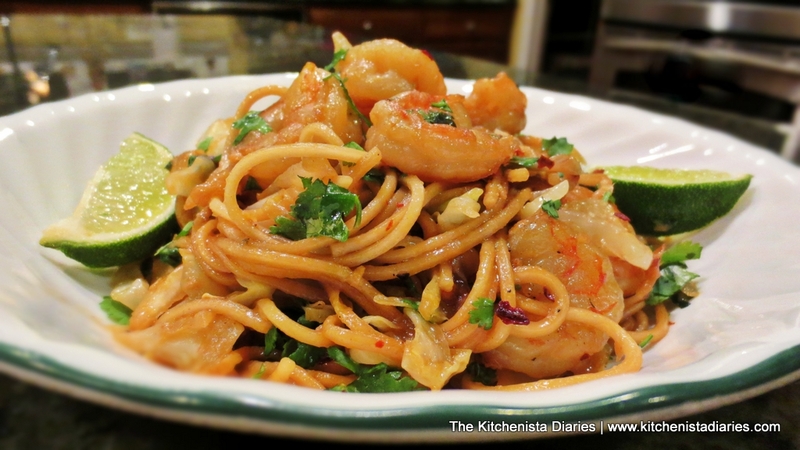 They have tiny ridges on the surface of the noodle that are perfect for grabbing sauces in baked dishes. Low-fat milk may be used in place of whole milk for a lighter sauce, however skim milk would not have enough fat for a proper sauce, and I’ve found half & half to be too rich for the dish. 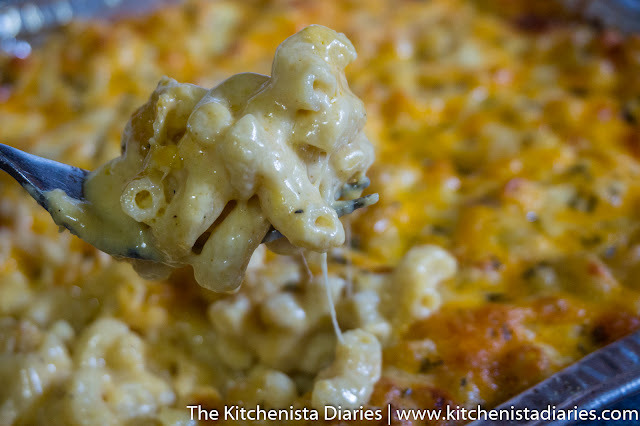 Seasonings are what will set your mac & cheese apart from the rest. I used to rely on seasoning salt, but I've found that most have a tad bit too much garlic powder that takes away from the dish. For that reason, I add salt, paprika, and black pepper separately. Mustard, cayenne and Worcestershire sauce all work together to cut through the richness of the cheese and bring out its flavor. The onion and bay leaf add subtle depth to the cheese sauce when steeped in the warming milk, and combining parmesan cheese with seasoned panko bread crumbs adds a nice crunchy salty finish than bread crumbs do alone. Finally, buy whole nutmeg and grate it fresh for your dishes using a microplane grater. Pre-grated nutmeg tends to have lost much of its flavor. Preheat your oven to 350° F. There's a few things you can get out of the way first as prep work. 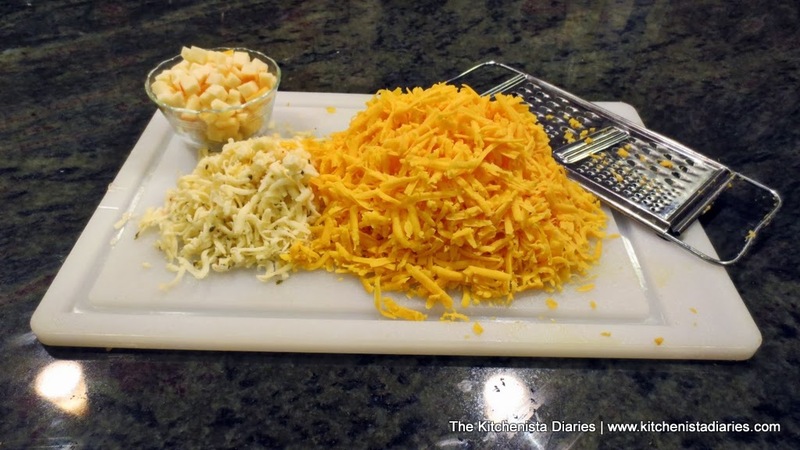 For starters, grate the cheddar and pepper jack cheeses. Dice the Muenster cheese into small cubes, approximately 1/4" or so. When I'm making a double recipe, I'll use a food processor to grate my cheese but for this amount, it's usually not worth the extra dishes! 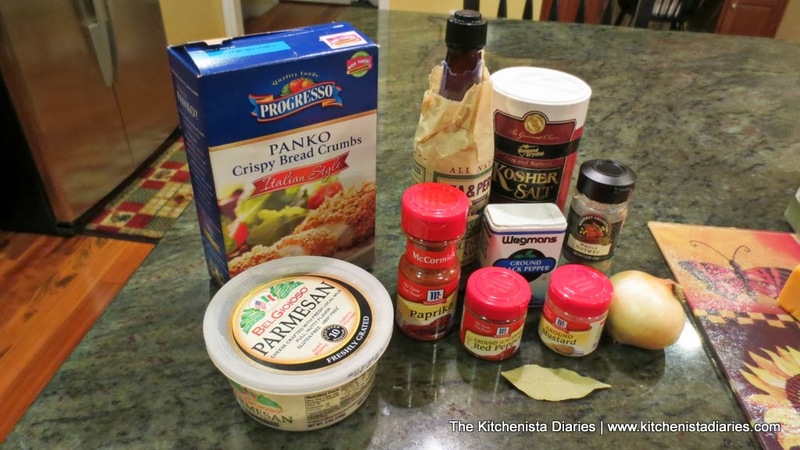 Prepare the Parmesan & Panko topping. 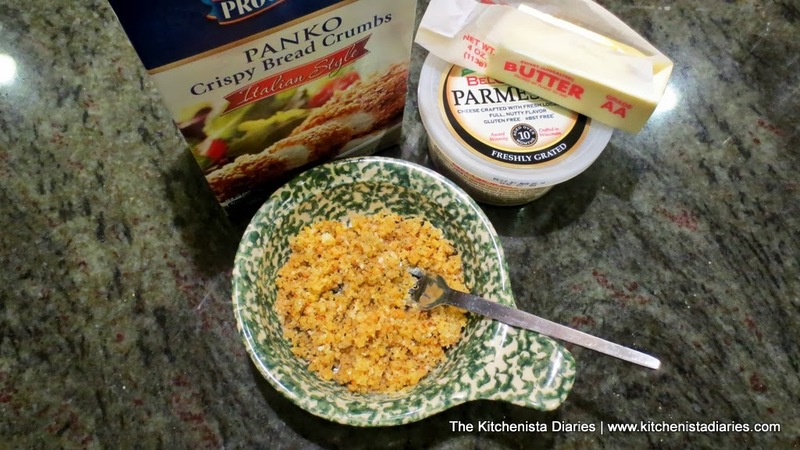 Melt 2 tbsp of the butter, and toss with the breadcrumbs and Parmesan cheese in a small container. Set aside. Butter a large casserole dish. I use a ceramic, lasagna sized pan. I've found that deeper dishes often don't cook evenly as the sauce doesn't thicken up at the same rate towards the bottom. To your small saucepan add all 5 ½ cups of milk, the peeled onion (cut in half), and the bay leaf. On medium low heat, gently warm the milk until it is steaming hot but not boiling, then reduce heat to simmer. 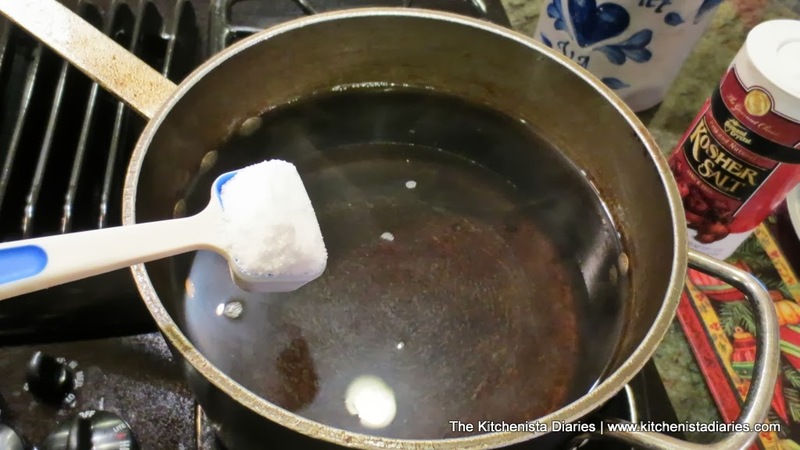 Only 5 cups is needed for the sauce; the extra ½ cup of milk accounts for what is lost through evaporation and straining. The bay leaf and onion should steep for 10 minutes or so in hot milk before adding to the roux, so time yourself accordingly. I taste a bit of the milk after it's warmed; you should be able to detect the hint of bay leaf and onion. Finally, if you haven't already done so, get your water boiling for the noodles. When cooking pasta, it's important that the water is heavily salted. You'll need a tablespoon or two; the water should taste salty like the ocean. 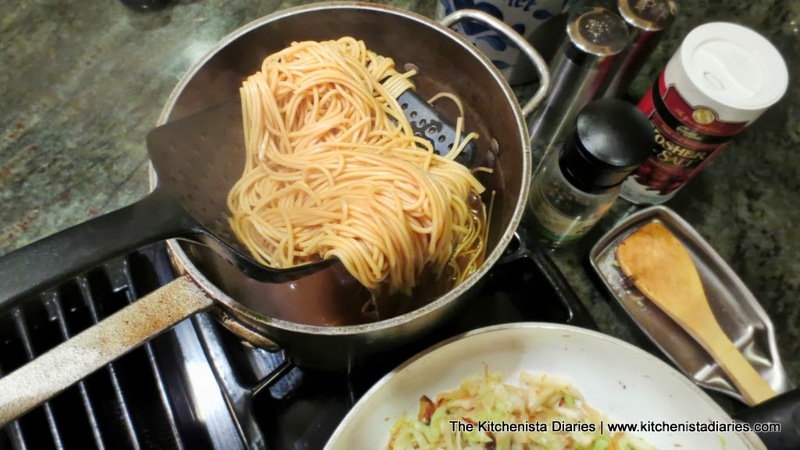 This is important to properly season any pasta that you cook. 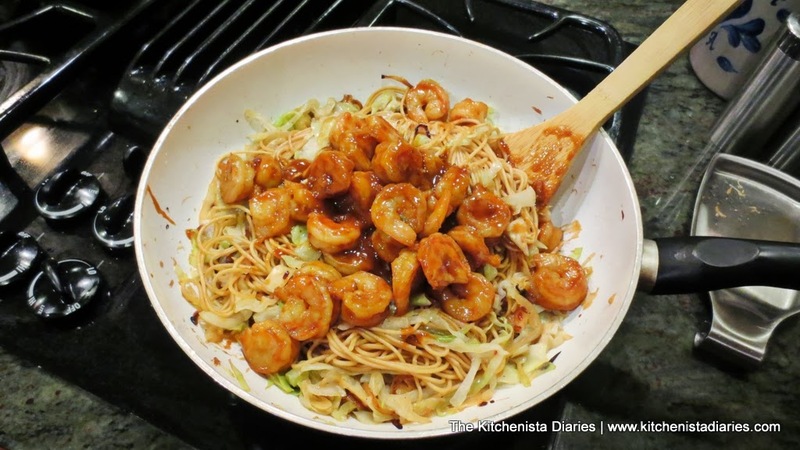 Never add oil to the water; this prevents the sauce from adhering to the noodles. 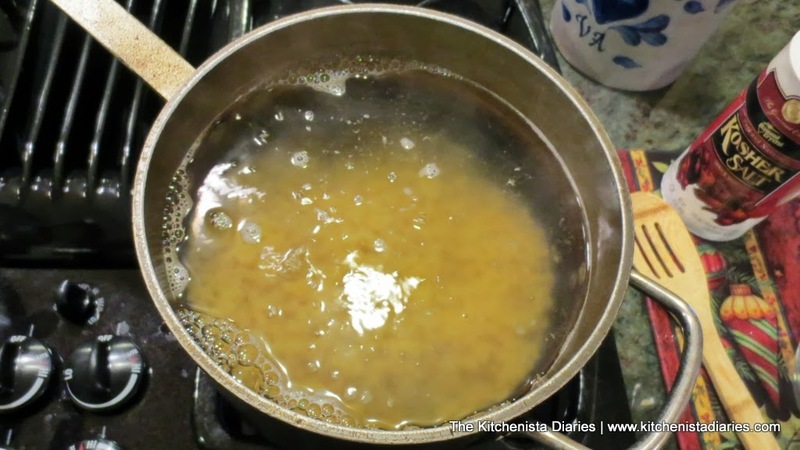 In your large saucepan, start your roux by melting the remaining 4 tablespoons of butter over medium heat. Do not let the butter brown. 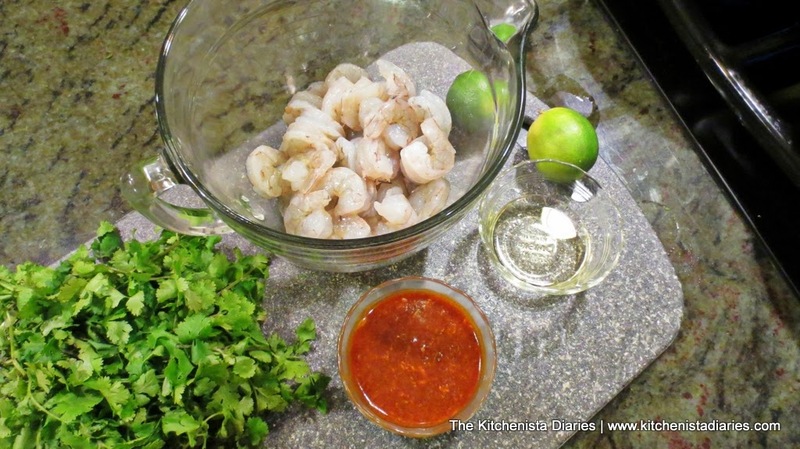 Just as it begins to sizzle, add the 1/2 cup of white flour. 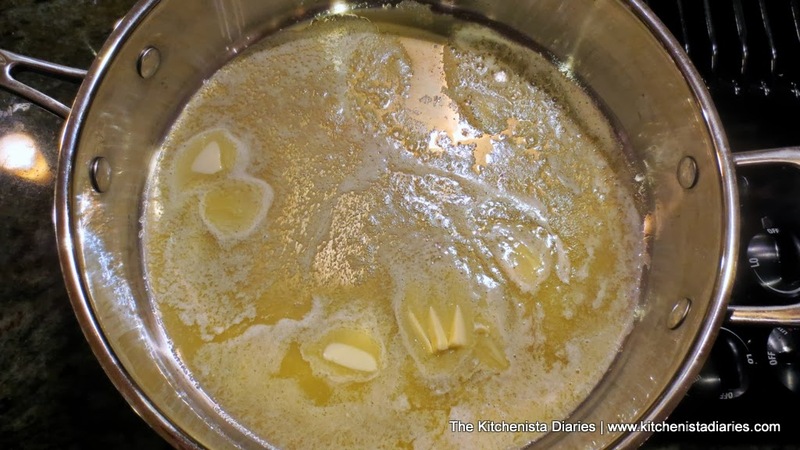 Whisk the flour into the butter so that it completely dissolves. Continue whisking for another couple minutes to cook the flour. 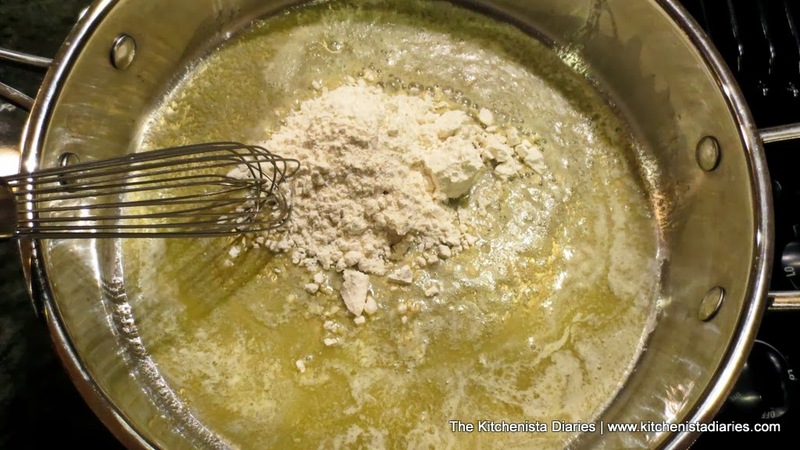 It's important to do that to avoid the taste of flour later in your sauce.This is your roux. It will thicken slightly and turn slightly golden. 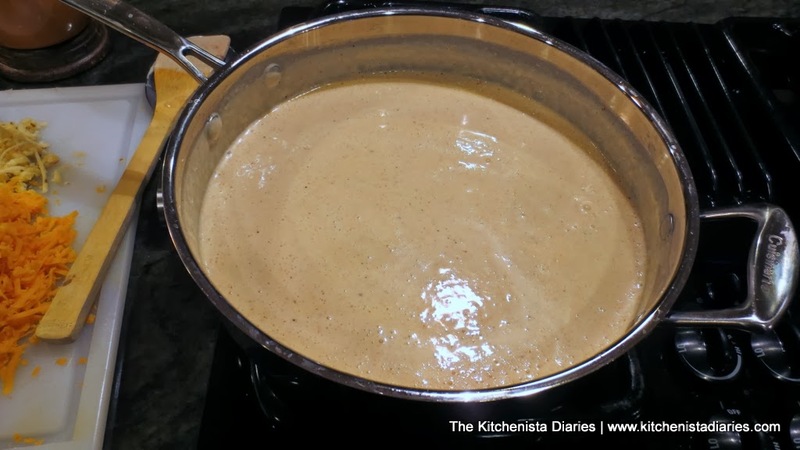 There is no need to take it further than that for mac & cheese, but if you're familiar with making gravy or gumbo, you'd continue cooking the roux until it is much darker and caramel colored. 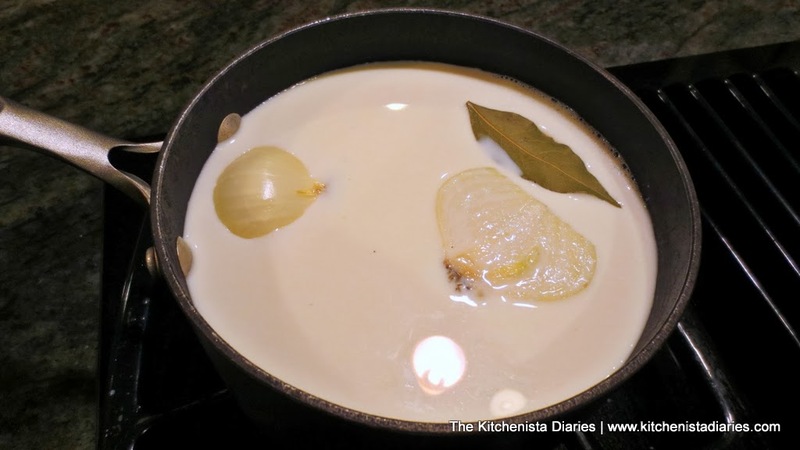 Strain the hot milk to discard the bay leaf, onion, and any stray particles. 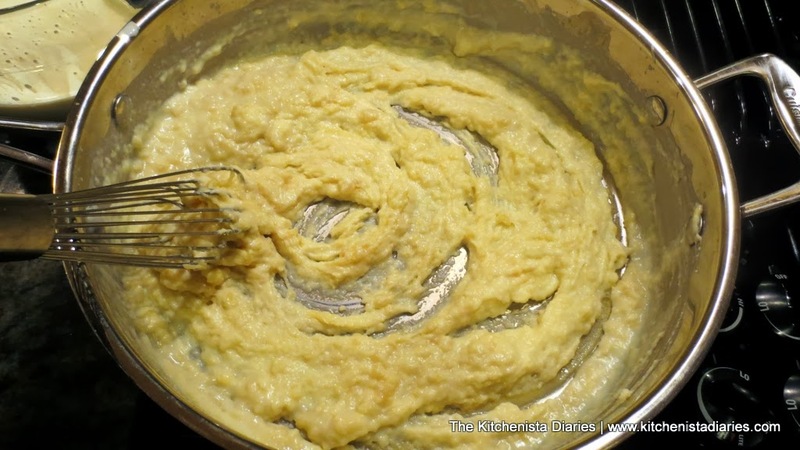 Quickly whisk in a cup or two of hot milk at a time into the roux. 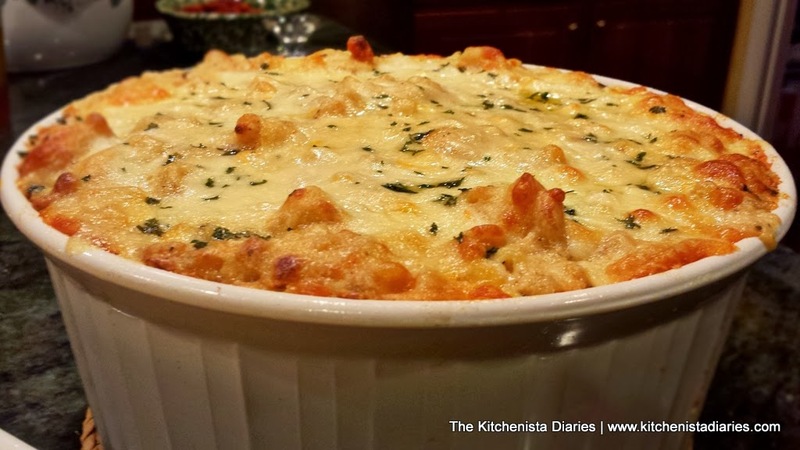 It will thicken up considerably before you get a chance to add all of the milk. Just whisk vigorously with each round of milk. Adding all of the milk at once can make it easier to create lumps. When all of the milk has been incorporated you'll have a thin white sauce. Now, here's the trick that I learned in my research and ended up using. If despite your best efforts, you still end up with a few lumps in your sauce, the easiest and fastest way to fix this is using an immersion (stick) blender to blend your sauce. Lumps gone. Who would have thought? It's such a convenient and inexpensive tool to add to your kitchen! Of course, you could resort to whisking your life away or create a mess straining the sauce or transferring it to an upright blender, but trust me...the immersion blender is a life saver. 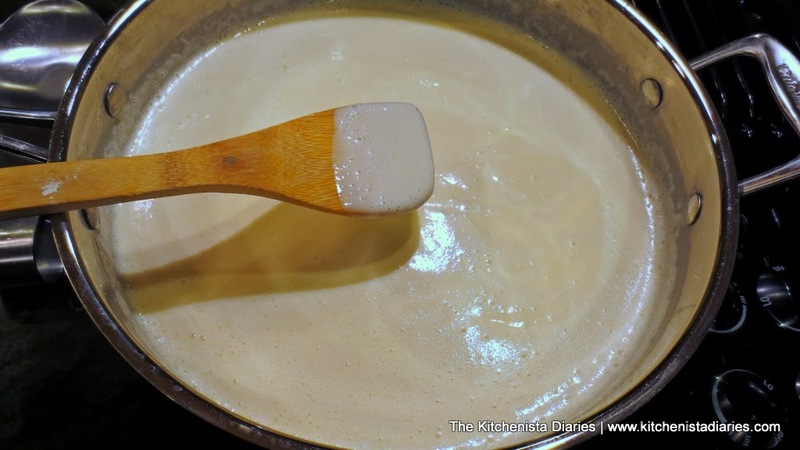 Allow the béchamel sauce to heat until it is gently bubbling, then reduce heat to low. 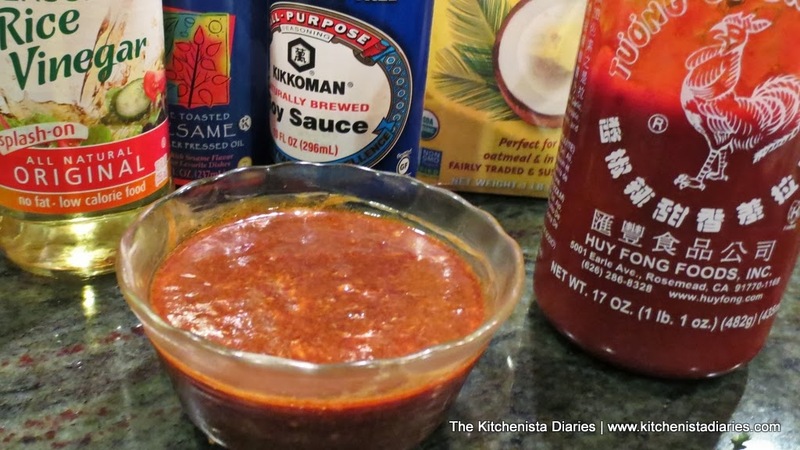 The sauce should be thickened at this point and will get a little bit thicker as it simmers. It should easily coat the back of a wooden spoon once done. I like to season my sauce now and adjust after it's finished simmering. Add the paprika, mustard, cayenne, black pepper, salt, freshly grated nutmeg and Worcestershire sauce and stir to incorporate. 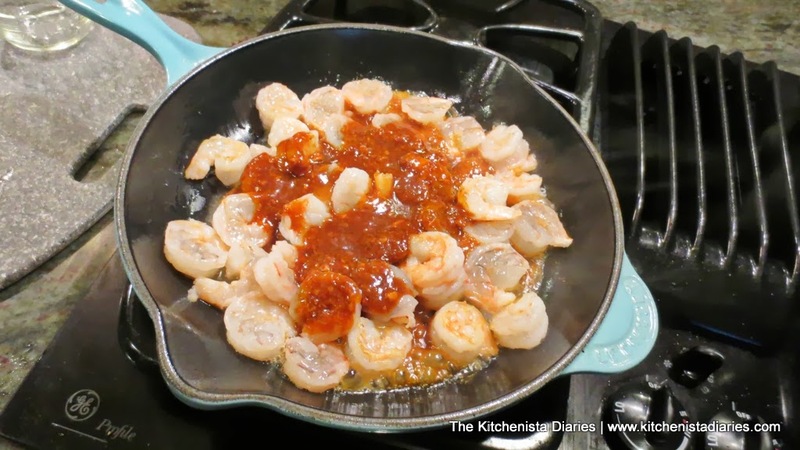 Don't go overboard on the nutmeg - you should be able to taste a hint of it in your sauce but it shouldn't dominate. 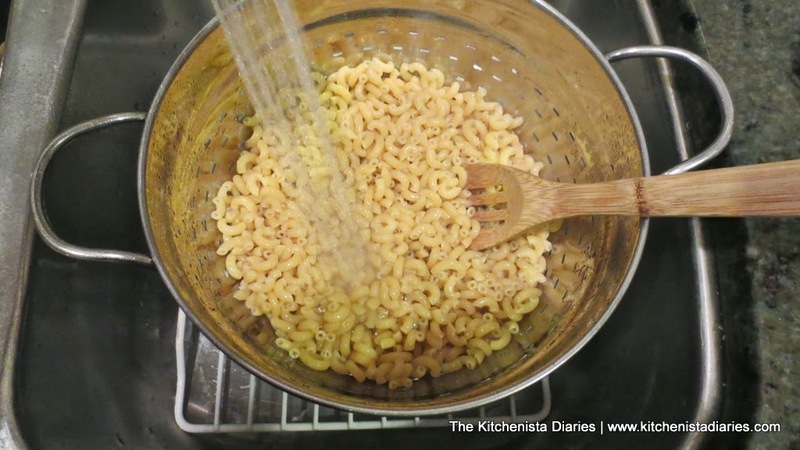 This is the perfect time to add your macaroni noodles to the boiling water. Per most package directions, al dente is around 8 or 9 minutes. 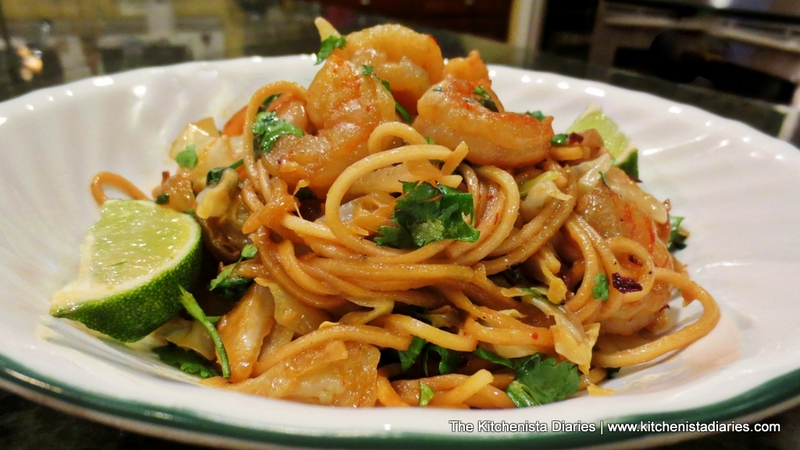 You'll want to undercook these noodles, so I time it for 5 or 6. 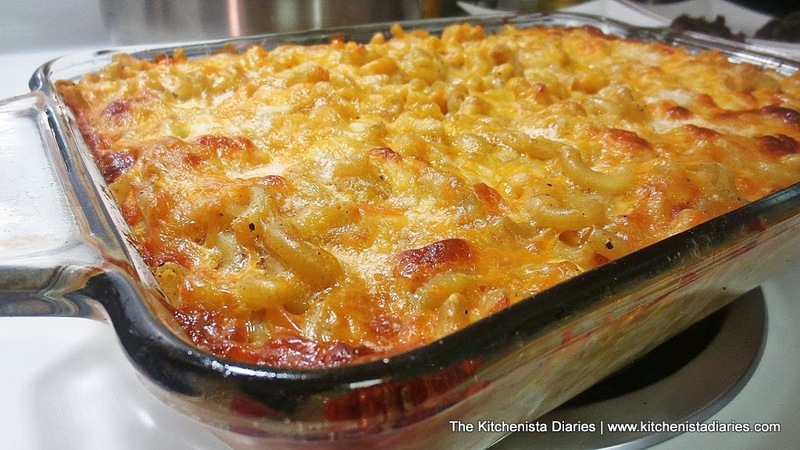 This gives the noodles a chance to finish cooking when the mac & cheese bakes without getting mushy. It also is the right amount of time for your béchamel to finish thickening. When the noodles have cooked (taste one - it should still be somewhat firm with a bite left to it) transfer to a large sieve to drain the water. Rinse in cool water to stop the cooking process. 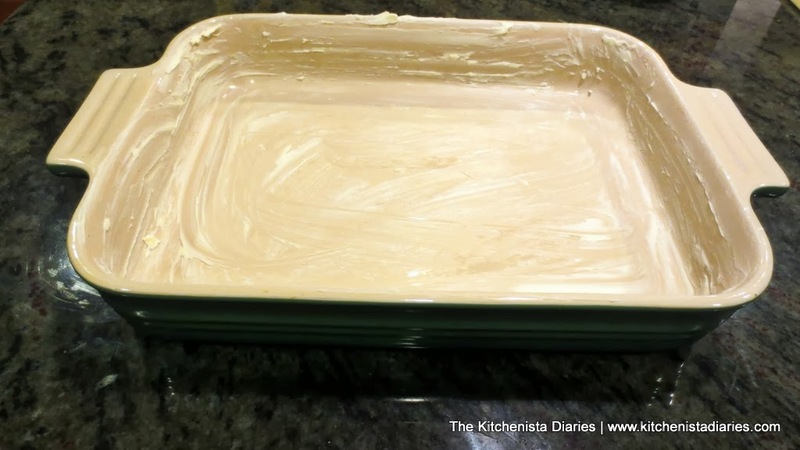 This also removes some of the starchy water that could over-thicken your cheese sauce in the oven and become mealy. 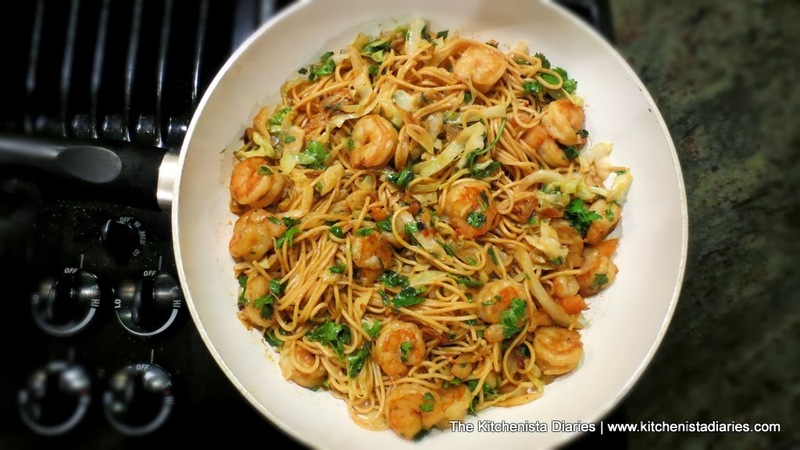 It is one of the few times I ever rinse off my noodles! 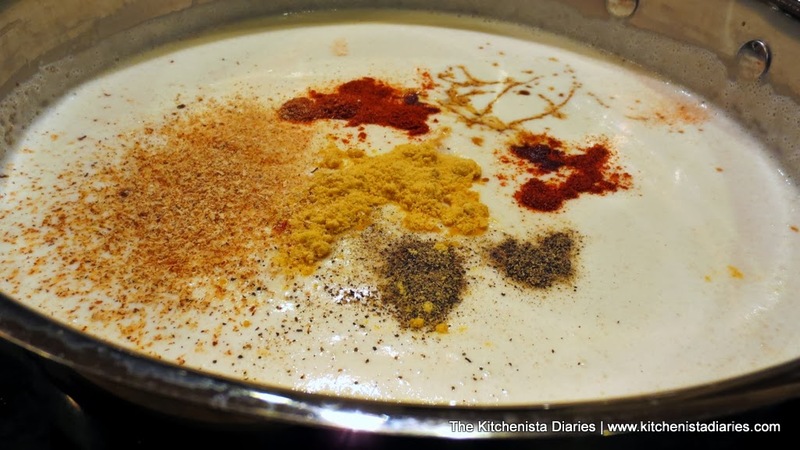 Taste test your béchamel sauce for seasoning and adjust if desired. I'd be careful with salt though, as the cheese adds a bit more salt to the sauce itself. If in doubt you can adjust seasonings after the cheese is added too. I can usually tell when it's still a white sauce whether or not anything needs to be added though, and it's typically just a little bit more black pepper and a dash of cayenne. Remove the sauce from the heat and stir in all of the pepper jack cheese cheese and all but 1/2 cup of the shredded cheddar. 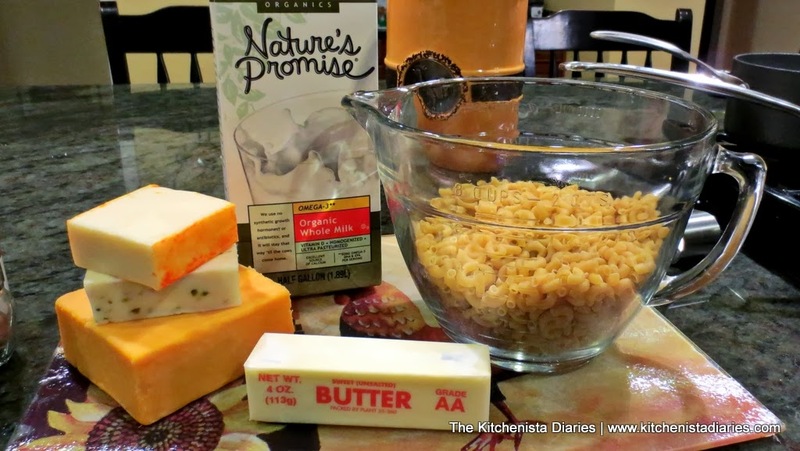 We'll use the Muenster cubes and the remaining cheddar to top our mac & cheese later. 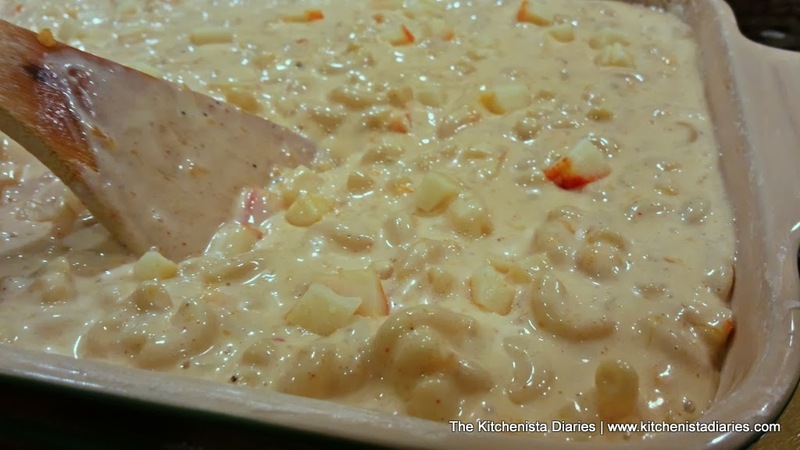 Stir the cooked macaroni noodles into the white sauce being sure to break up any noodles that were stuck together. 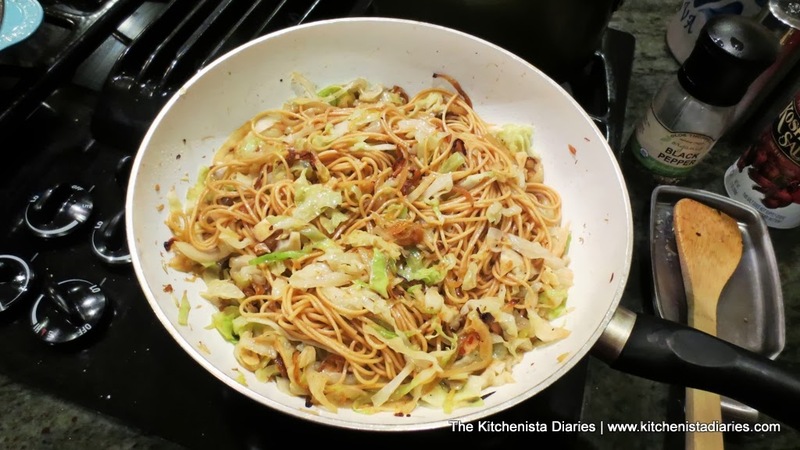 When all of the noodles are well coated in sauce, transfer it all into your buttered casserole dish. Because Muenster cheese melts so well, it's nice to have little globs of melted cheese in the finished dish. 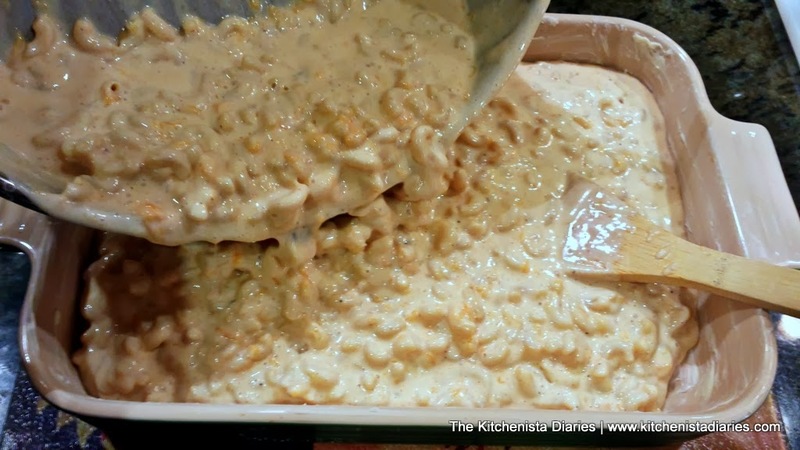 Add the cubes of cheese to the macaroni, poking them slightly under the surface until they are all evenly distributed. 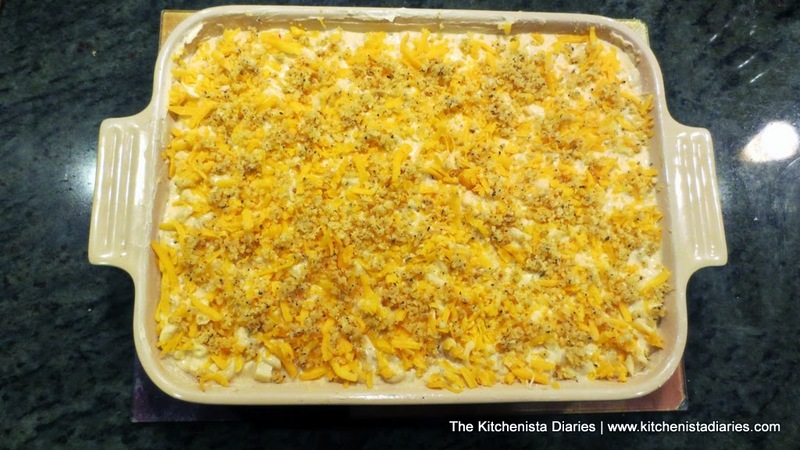 Sprinkle the mac & cheese with the remaining 1/2 cup of shredded cheese and buttery breadcrumb topping. You just want a very light coating of crumbs, so if you're using a smaller dish you may not need it all. Bake at 350° F for approximately 30 to 40 minutes until it is bubbly and golden brown! Remove carefully from the oven and allow to cool for a few minutes before serving. 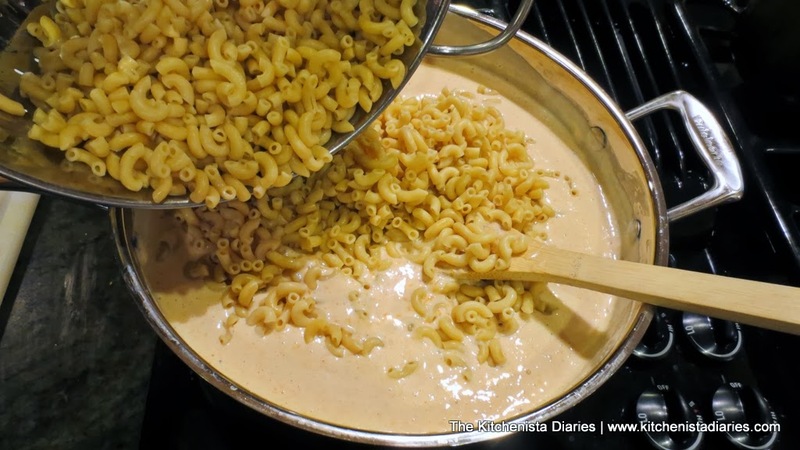 When done, the cheese sauce will have thickened up and be absorbed by the noodles. 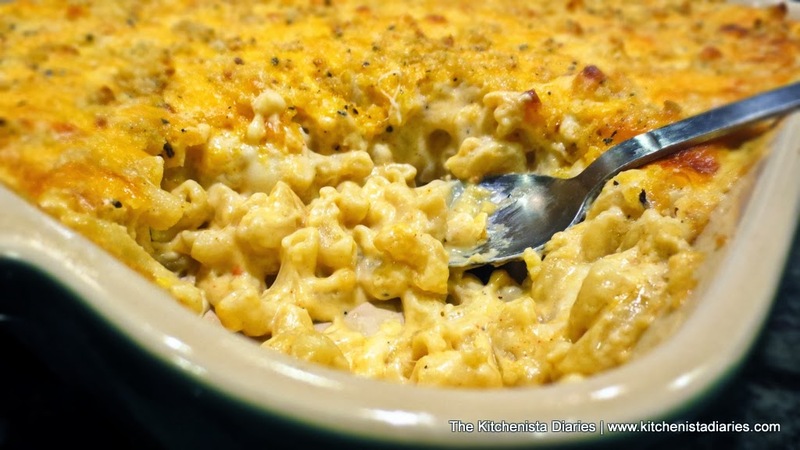 It is creamy and silky and everything a custard style mac & cheese could never quite be! All of the flavors add to the dish without any standing out more than the other; even the peppers in the pepper jack add just the right amount of heat to complement the rich cheddar cheese. 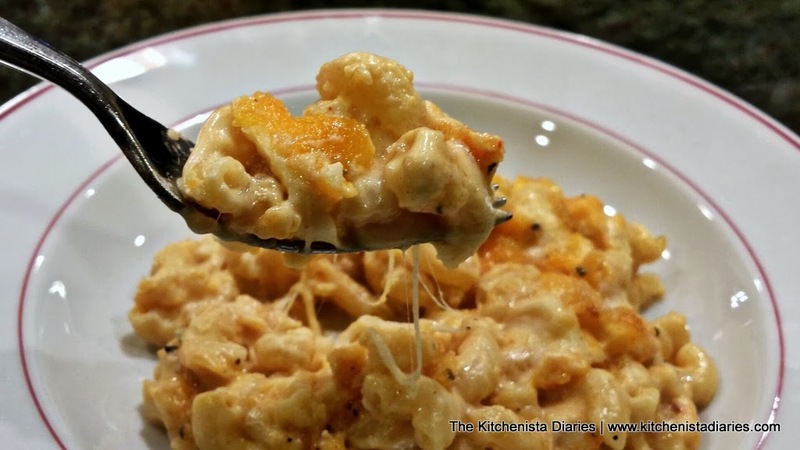 The whole milk imparts a lovely richness to the mac & cheese without being too heavy, and the light crusty topping is a beautiful textural contrast to the creamy noodles inside. I enjoyed every last bite...and I hope you do too! Update 5/11/14... finally had an excuse to make mac & cheese again for a bbq! This time I baked it without the breadcrumb coating. I know some folks prefer it without so do what makes you (and your family) happy! Good morning! Now that y'all are busy baking biscuits for breakfast, how about another recipe that's perfect for a cozy weekend morning? 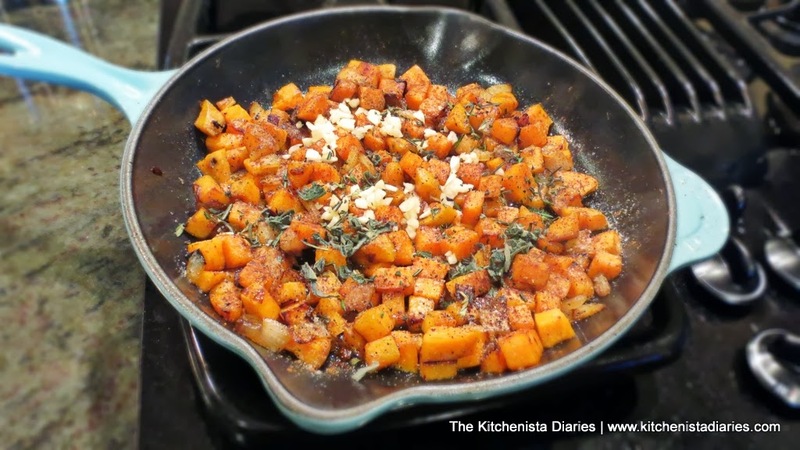 When it gets deep into winter beyond the holiday season, I'm always looking for creative ways to cook sweet potatoes and this one turned out to be a keeper. 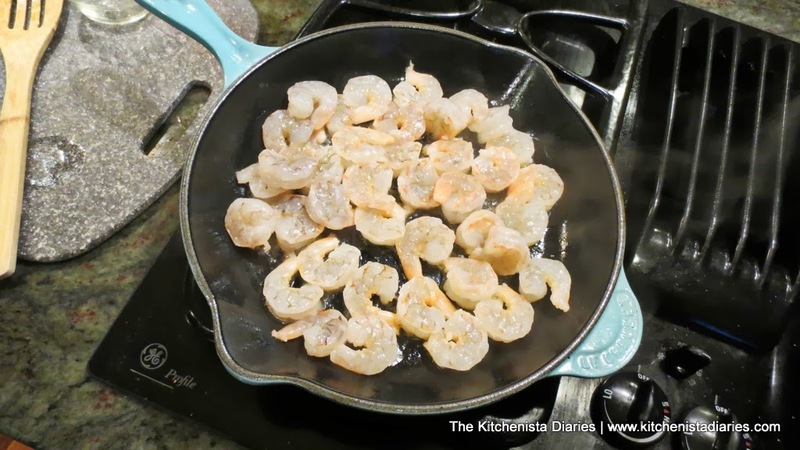 It's all done in one pan, so now would be the time to break out that seasoned cast iron skillet and put it to good use. What I like about hash is that much like stir fries, it's a relatively easy way to clean out the fridge and pantry at the end of the week and use up those leftover odds and ends. 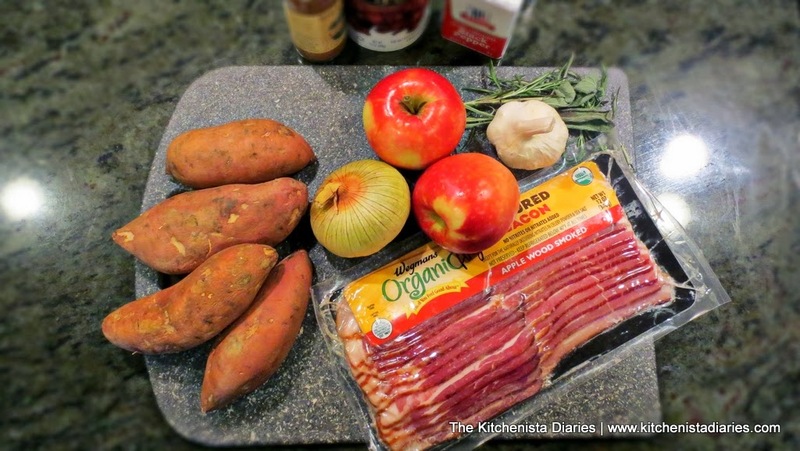 This recipe does a great job of highlighting the fall & winter seasons using both sweet potatoes and apples alongside smoky bacon, savory sage & rosemary, and a hint of cinnamon. Be sure to make use of your favorite local variety of apples - any crisp, sweet-tart apple will do! 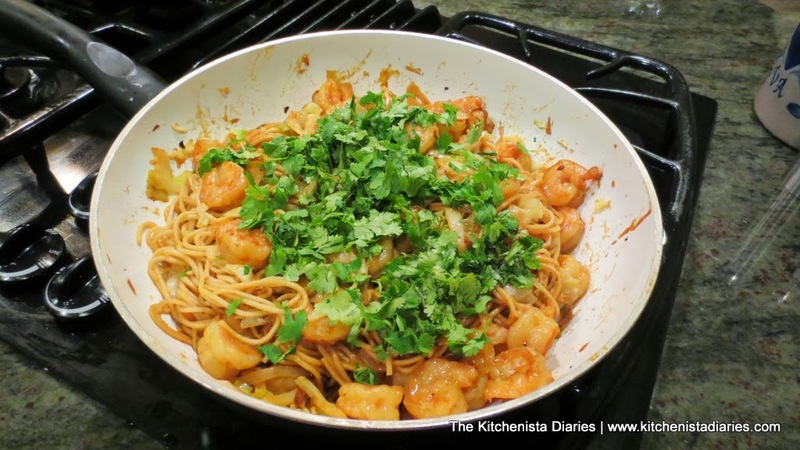 I wrote the quantities for the ingredients loosely, so adjust to fit the size of your skillet as needed. 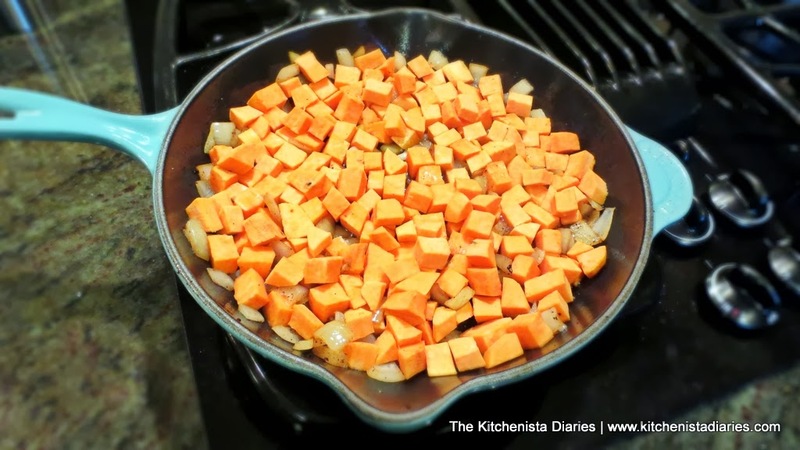 The key here is to only add enough sweet potatoes that will fit to cover the bottom of your skillet. That way, they'll crisp up nicely instead of steaming in an overcrowded pan. 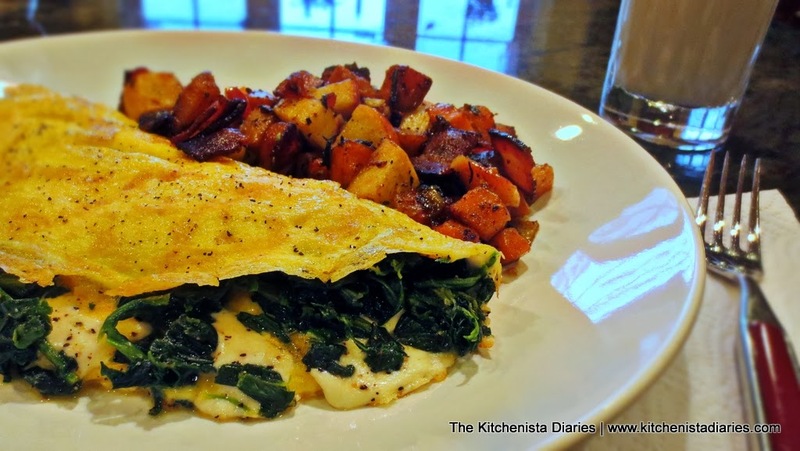 We enjoyed our hash as a side to spinach & mozzarella omelettes per Jaden's request. However, it could just as easily be a main dish - add a fried egg on top and you've got an impressive, hearty winter meal on the table in no time! P.S. 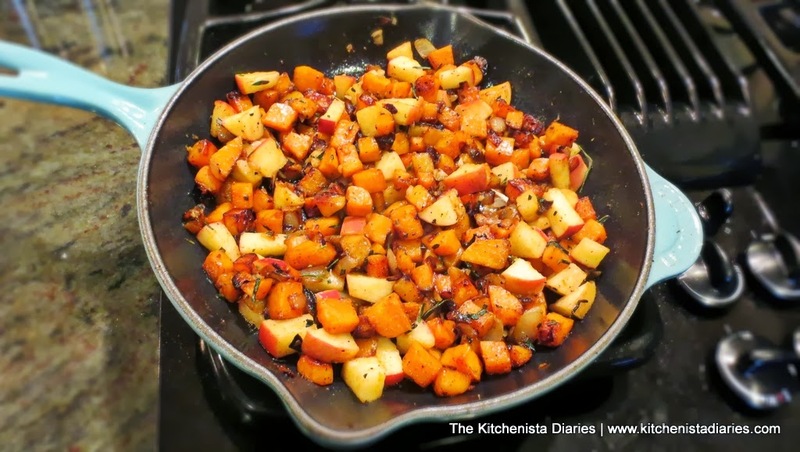 If you love this recipe, check out my older posts where I used sweet potatoes to make spicy hash browns and a turkey sausage & white sweet potato hash! 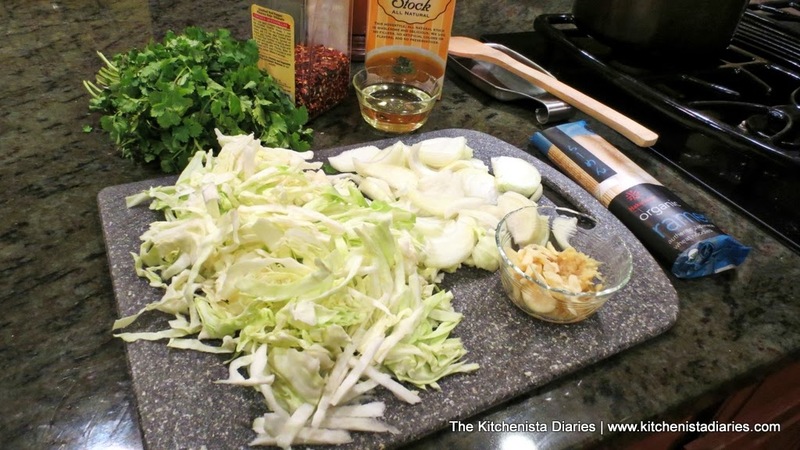 Typically I would prep all of my ingredients in advance of cooking, but because this dish has plenty of downtime in between adding ingredients to the skillet, you can prep as you go if you'd like. While the bacon cooks you can dice your onions and potatoes; while the potatoes cook you can dice the apples, and so on. Just keep your eye on what's cooking! I ended up only using 3 of the above pictured sweet potatoes, or about 2 cups peeled and diced. As long as the sweet potatoes are organic, you can leave the skins on if you wish. Mine looked a little funky so I decided to peel them instead. 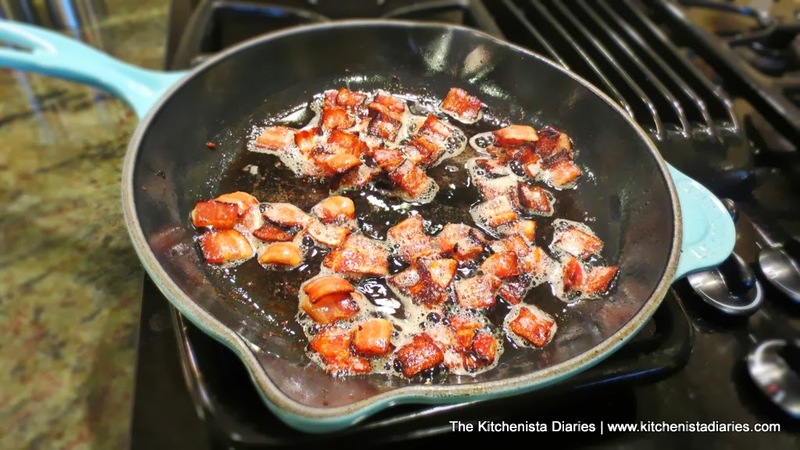 To a cold skillet, add 6 strips of bacon, sliced into 1" pieces. Turn up the heat to medium and fry the bacon until crispy. Carefully remove the cooked bacon and set aside on a paper towel lined plate to drain. 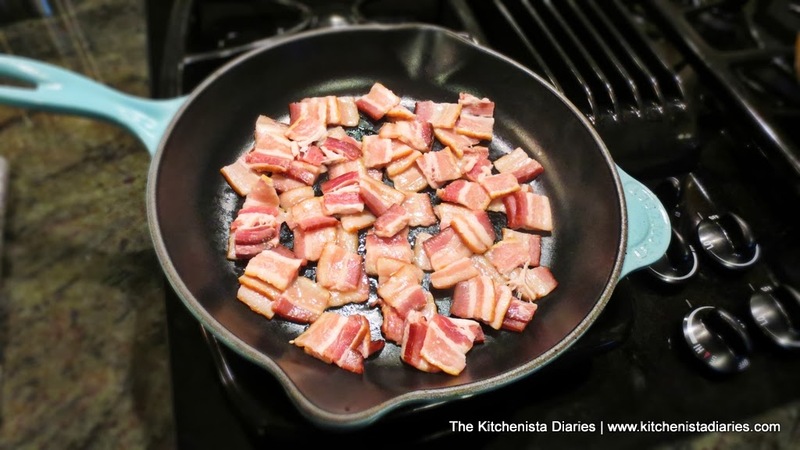 Reserve 3 tbsp bacon fat in the skillet. If you don't have quite enough fat left, you can supplement with a light olive oil or grapeseed oil. I almost always have leftover bacon fat in the fridge though! 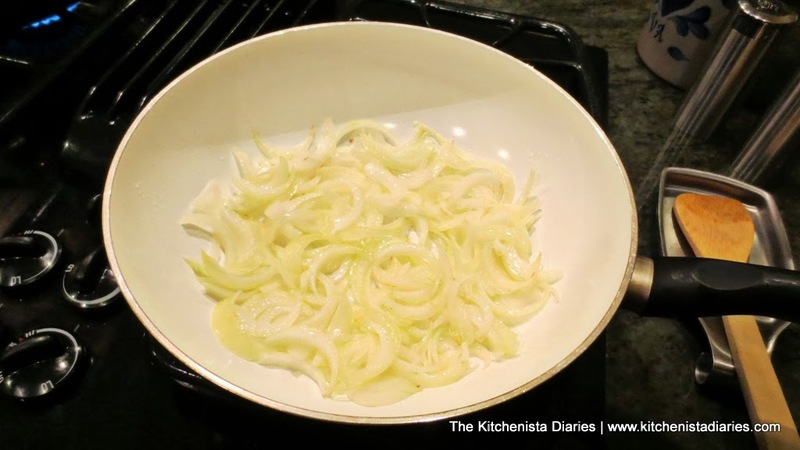 Add the diced onions to the skillet and cook for a couple minutes until softened. Season with a pinch of salt and pepper. 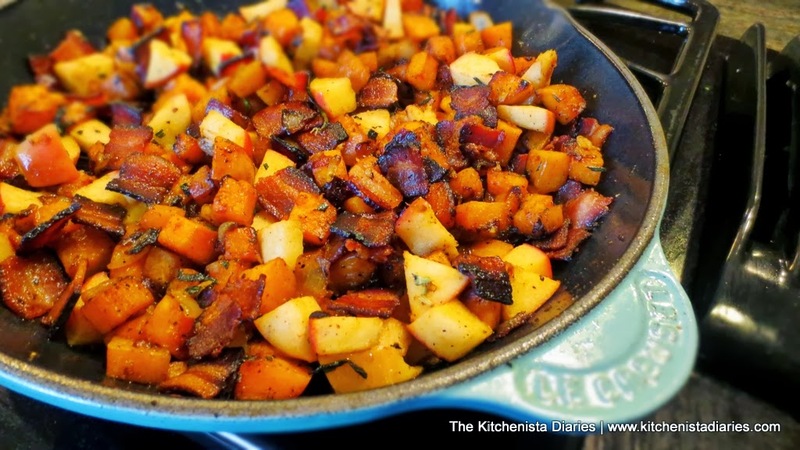 The beauty of this hash from this point forward is that everything else stays in the skillet. 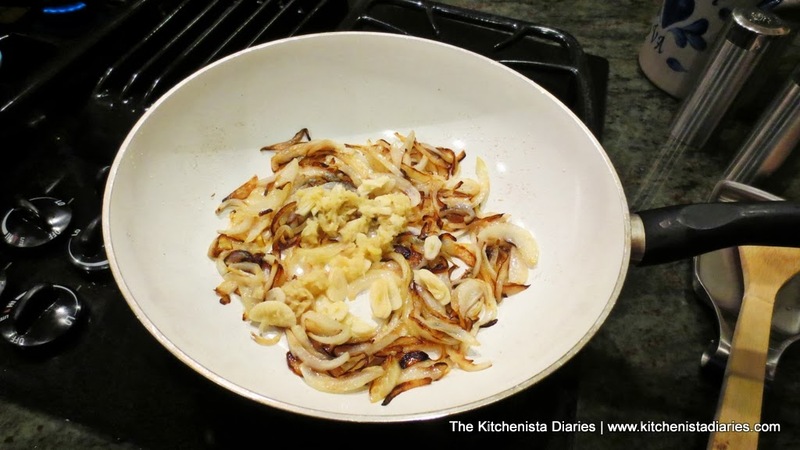 The onions will continue to cook and caramelize through the very end. 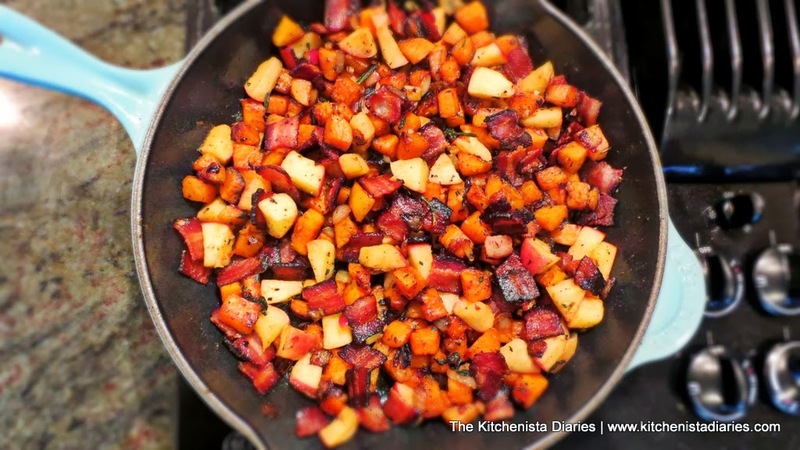 Add the diced sweet potatoes to the skillet. These are diced in about 1/2 inch cubes or so. You want them fairly small so that they cook through at the same rate that they crisp on the outside. 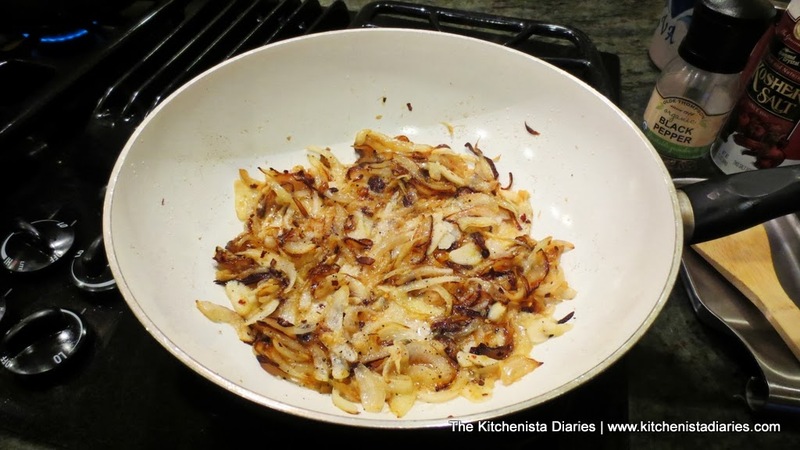 And again, only add what can comfortably fit into the bottom of your skillet in a single layer. This is crucial to getting crispy potatoes. 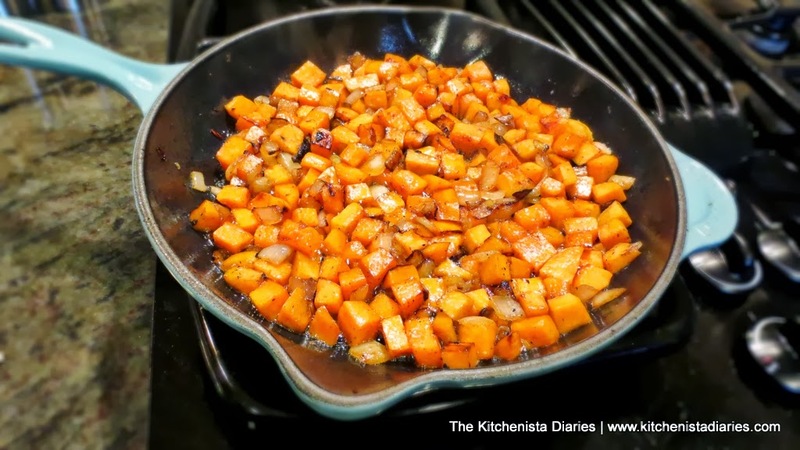 Press the sweet potatoes into the skillet and allow to cook for a few minutes on one side. You may need to adjust your heat slightly higher at this point. After a few minutes, use your spatula to flip the potatoes over and press them back into the skillet to continue cooking. You'll repeat that a couple more times until the sweet potatoes have gotten crispy around the edges. 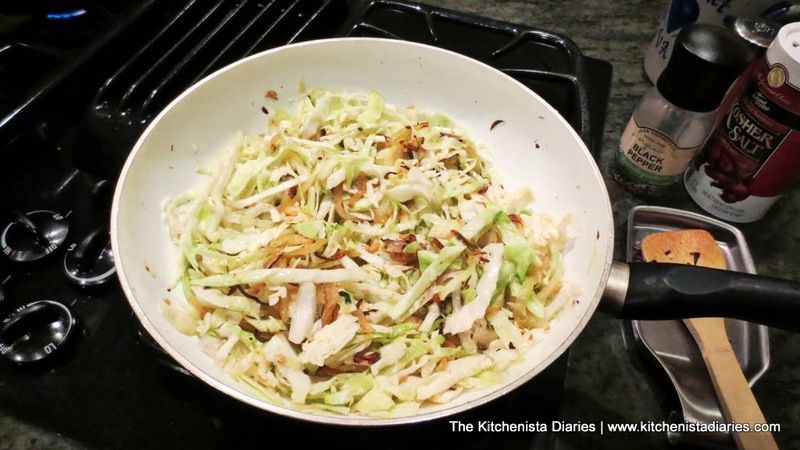 If the pan gets dry at any point, add a little more bacon fat or oil. Season the sweet potatoes with a pinch of salt & pepper towards the end. Add the chopped garlic, herbs and cinnamon. Toss to evenly distribute and cook just a minute or so until fragrant. I added the garlic and herbs at the end of the cooking process so that they wouldn't burn before we got to the finish line! 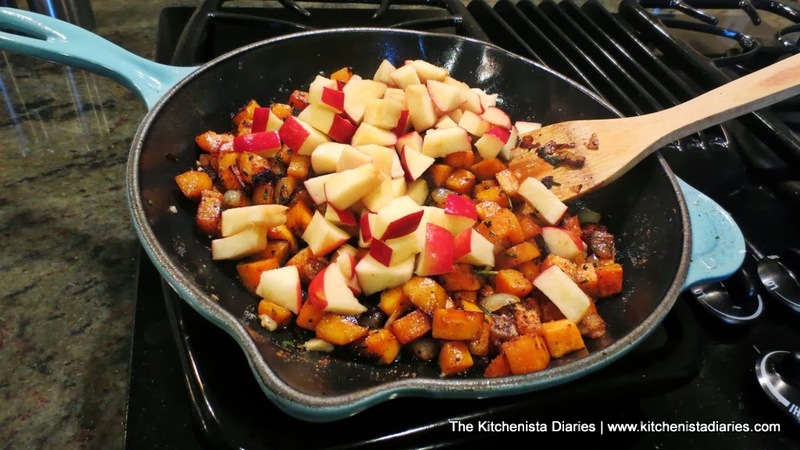 Reduce heat and add the diced apples to the skillet and cook just until the apples are warmed through. 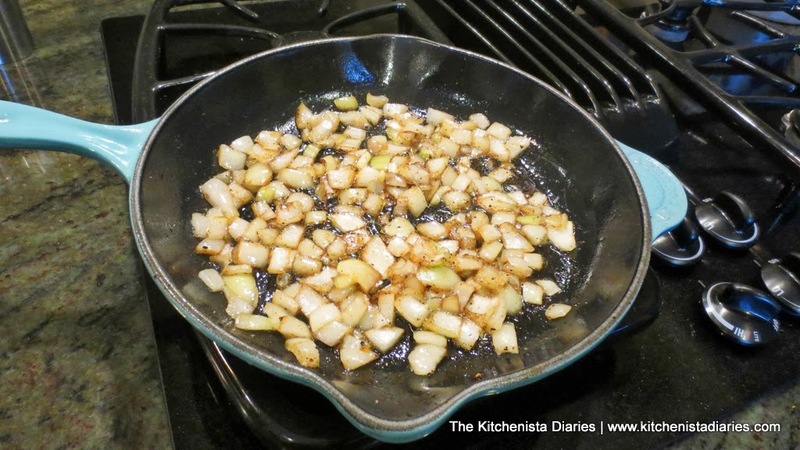 You want the apples to stay crisp, so that they contribute to the texture of the hash. By this point your sweet potatoes are tender, so make sure you are gently moving things around. You don't want to mash them. Turn off the heat. Check seasoning; adjust salt & pepper if necessary. You shouldn't need a lot of salt though as the bacon adds plenty. Add back the crispy bacon to the skillet. 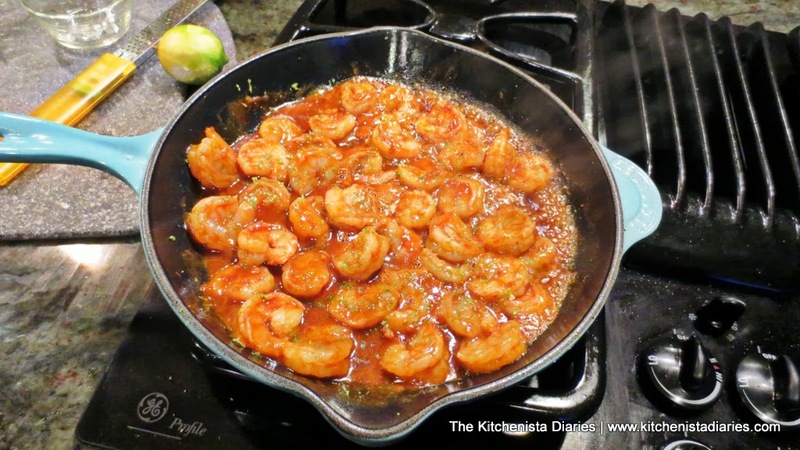 Toss to evenly distribute and serve hot!